It has become a little bit of a tradition in our house, ever since Lara was born, to splash out on a few special outfits as a Christmas present. Of course, this year we have two girls to buy clothes for and that makes it all the more exciting. Last week I put in a mahoosive order at Vertbaudet who have recently become my clothes supplier of choice for both of the girls. I love their grown up yet dainty designs and muted colours which make them both look so feminine. We are all really in to purples and greys in this house right now. The best thing about buying the girls clothes for Christmas is that it is the only time of the year that Mr. B. actually gets involved in clothes shopping. For some reason he actually quite enjoys choosing clothes at this time of year and no other so I embrace it and let him get really involved in the decision. This year Mr. B. and I set ourselves a budget of £100 for Christmas presents for each of the girls and I'll admit that we used over half of that budget for Lara on clothes and a third of it for Holly. We think me might get away with that for Lara this year but next year when she is 4 and has started school, we suspect we may have to buy the things she asks for rather than things we thing she would like! Interestingly, after a particularly "fun" trip to the shoe shop recently, Lara put a foot measurer on her Christmas list. Vertbaudet actually sell foot measurers and I was going to have bought one but Mr. B. stepped in and told me that it was such a rubbish present that I wasn't allowed to buy it! 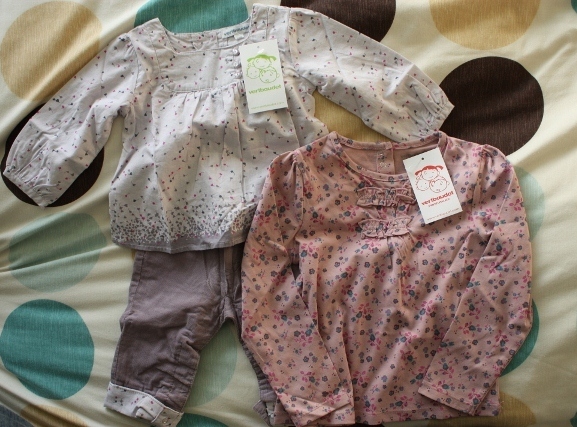 I thought I would give you a sneak preview of the clothes we have bought for Holly and Lara for Christmas. They aren't really matching but their outfits do have a similar feel about them, don't they? 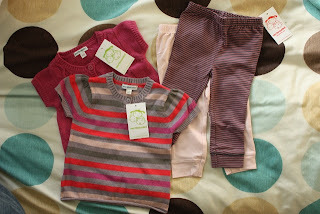 Leggings are a staple in our house and right now we can't have enough long sleeved tops for either of the girls! 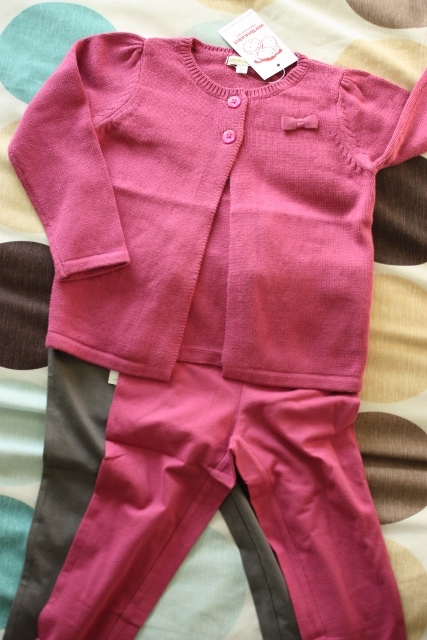 I also really liked this lavender grey coloured outfit for Holly. Disclosure: I was asked to write this blog post but I bought the items myself before being asked to write the post. This doesn't stop the blog being honest and fun to read.